Licenses: Fully licensed to transact business in all 50 states and possesses the authorities to write accounts on either an Admitted or Surplus lines basis. 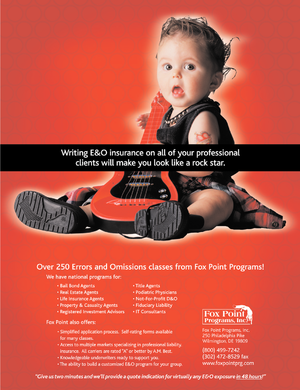 Fox Point Programs is an insurance agency specializing in professional and management liability product lines. We are fully licensed to transact business in all 50 states and can write accounts on either an admitted or surplus lines basis.